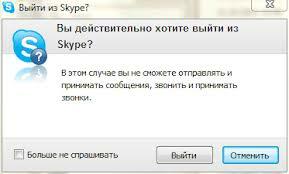 For starters, Skype users can often cause problems with the closure of the program, as usual click on the X in the upper right corner of the window does not close the program, but only minimizes it to the system tray. In this article we will look at two ways, how to get out of Skype. If the program is up and running, locate in the lower right corner of the screen (there, where the clock) badge Skype. If it is green - it means you are online. Click the right mouse button and from the menu select the option Exit from Skype. For, to get out of your account and open a window with login and password, needed in the main window, select the menu Skype and then Go out.